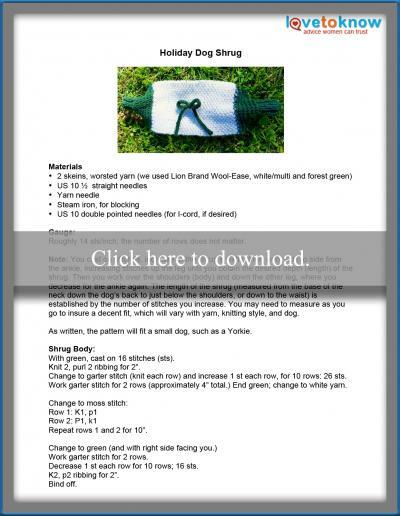 Use these free Christmas sweater patterns to knit your dogs something special to wear for the holidays. Both of these patterns are simple, cute and fast to knit, which also makes them perfect for last-minute gifts or Christmas card photo sessions. The following free, original patterns are fun to make and easy to knit. To print the instructions, click on the link in the image. The printable will open up in a new tab and from there you can download or print. If you need help, see this guide for Adobe printables. This classic lets you dress up your canine companion for a Christmas Eve visit. This pattern is worked entirely in garter stitch and requires a crocheted edging. Leave off the edging or the black belt for a more simple project. The Christmas sweater is a quick, easy and stylish shrug for your favorite friend. This simple shrug has you start with a small width, knitting for the leg/ankle first and increasing the width as you go along to fit around the dog, and then working your way back down the other leg, decreasing the width. It's suitable for small dogs. You may be allergic to certain fibers, and the same goes for your pet. If you have a short hair or hairless breed, check with your vet about possible skin reactions. Choose a fiber that has some elasticity. Yarn that is "flat" or without any spring to it may stretch out of shape. Sometimes, finishing a sweater can take almost as long as knitting it. Don't forget to factor in blocking, sewing and embellishing the sweater to your gift-making schedule. You can adjust most patterns for different dog sizes. Take the time to measure your dog across the shoulders, around the chest and neck, and from the base of the neck to the tail. You want the sweater snug enough to provide warmth, but loose enough that your dog doesn't feel confined. If you are using natural yarns (alpaca, wool), the fragrance might be attractive to your dog, so don't leave the sweater in reach of an avid chewer. 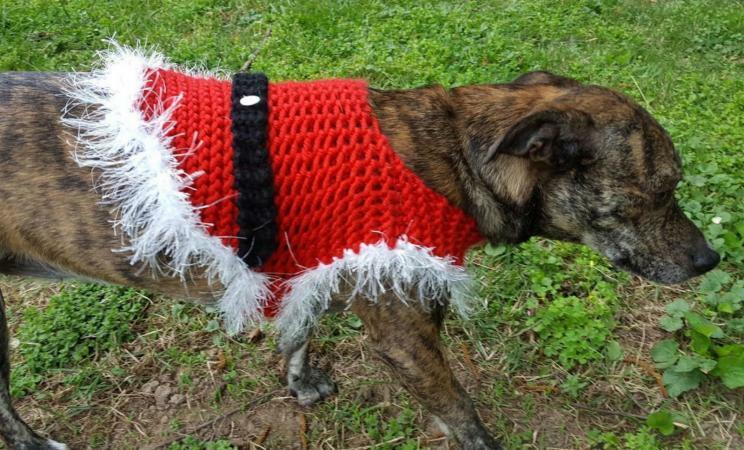 There are a few places where you can find patterns online to knit your canine friend a great Christmas sweater. Snowflake sweater: A warm sweater with elegant snowflakes will keep your fur friend warm and cozy while adding a bit of style to holiday celebrations. Winter Woof Sweater: Knit this winter sweater from the top down, so you can custom fit the sweater to your dog, and change the colors to suit your holiday preferences. Add holiday buttons, and Fido will keep off the frost in style. A website packed with knitting patterns, including many for your pet. 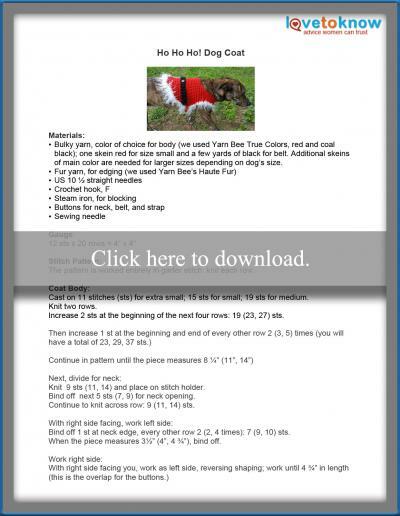 Here are a few free holiday dog sweater patterns to get you started. This site has a constantly changing selection of patterns like this holiday item. Join the club (it's free), and you can download everything from lacy holiday dog knits to the classics. Does Your Dog Love His Sweater? Make sure to plan ahead and decide when to start working on your sweaters. There's no time like the present for holiday gifts: if you are knitting for a small or extra small dog, you can knit a sweater in a few evenings or less. Larger dogs may take longer, but these patterns are simple, and once you get the techniques down, you'll knit along quickly. Sometimes the knitter loves the sweater more than the dog does. That's fine; it's the thought (and the warmth) that counts at the holidays. Add a healthy dog cookie to the package, and everyone will be happy.